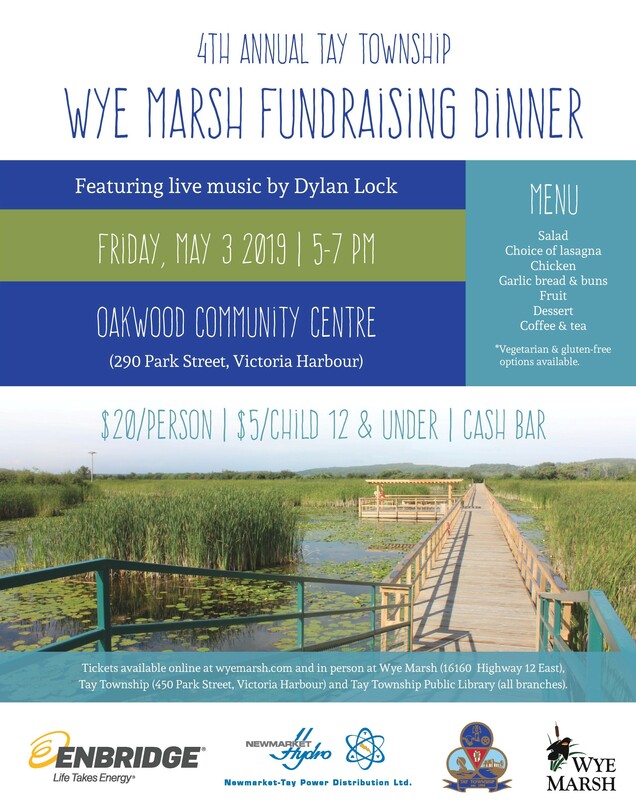 Join us for the 4th Annual Tay Township fundraising event for the Wye Marsh on Friday, May 3, 2019. The Fundraising Dinner will be held at Oakwood Community Centre in Victoria Harbour, 5:00-7:00pm. The Oakwood Community Centre is located at 290 Park Street, Victoria Harbour. Wye Marsh will be present with a few of our feathered friends. as well enjoy a delicious meal, live music by Dylan Lock, a raffle, cash bar, and a live auction! There will be 2 types of lasagna, chicken, a variety of salads, garlic bread & buns, fruit and fixings prepared by ELM Catering. Gluten free and Vegetarian options are available upon request. Tickets will be available online, at Wye Marsh, at Tay Township Municipal Office on Park Street, or at any of the Library's in Tay Township.